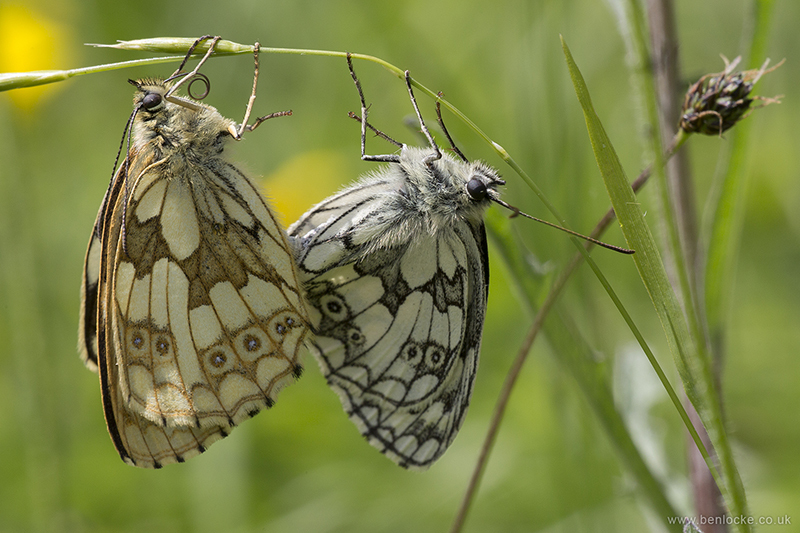 The female Marbled White was freshly emerged, and was in the process of drying out her wings after eclosion. At this stage she is unable to fly. The keen male spotted her hanging upside down, and they were instantly in copulation. However, the process of manoeuvring her in to position made her lose her grip and they both fell to the ground. Her soft wings crumpled and folded, meaning she had to crawl to the nearest blade of grass as quickly as possible, or she would never have been able to fly. She managed to do this, carrying the attached male as she climbed, and as shown in the photo, her wings unfolded perfectly.